Oil prices fell from the middle of last year through mid- to late-January. They have been broadly sideways since. The April light sweet futures contract has been largely confined to a $48-$55 range. The April Brent contract traded in a $55-$60 range in the first half of February and moved into a slightly higher range $58-$63. This stability of prices still appear fragile as output in the US and OPEC continues to rise. US output rose 39k barrels a day last week to 9.32 mln barrels a day. US oil output has exceeded 9 mln barrels since last October. A Bloomberg survey found expectations that OPEC output increase 163k barrels a day last month to 30.568 mln barrels a day. It would be the ninth month the OPEC surpassed its own quota. There were three developments that would have been expected to support prices better, but the price of Brent is lower for the fourth session. Libya has declared force majeure in 11 oil fields. ISIS has reported set several oil fields in northeast Iraq on fire. The lack of a deal on Iran over its nuclear program may keep more of its oil off the market. On the other hand, China's trade figures released over the weekend showed that oil imports by the world's second largest economy fell (in volume terms) for the second consecutive month. Oil imports fell by about 10% in February (to 25.6 mln tons. There are 6-8 barrels per ton (corrected initial estimate). The softness in domestic demand may be have exaggerated by the Lunar New Year. Iron ore and copper imports also fell in February. In any event, output is still rising faster than demand. Between imports and domestic production, the US is accumulating about a little more than a million barrels a day in excess of its consumption. Crude oil stocks rose 10.3 mln barrels latest period week according to the Department of Energy estimates on top of the 9.3 mln barrels the prior week. The issue of storage capacity has become more salient for investors. US crude stocks reached 444.4 mln barrels last week, the highest for this time of year going back to the 1930s. However, the Energy Information Agency (part of the DOE) acknowledged that its estimate of supplies includes the oil sitting in pipelines and at well sites, not just what is being conventionally stored. The International Energy Agency warns that crude oil stocks could bump against storage capacity limited by mid-year. The rise in inventories is expected to be front loaded in the first half of the year. Of the 270 mln barrel increase in oil inventories it projects this year, 245 mln are expected in H1 15. 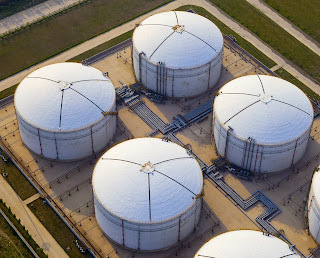 Cushing, Oklahoma, where the slight sweet crude is delivered to satisfy the settlement of futures contracts have tanks that can store around 85 mln barrels, though some of the tanks are used for blending and feeding pipelines, not just storage. Genscape, which uses infrared cameras and other technologies to estimate oil in storage report the storage in Cushing is about 2/3 full. In contrast, Genscape estimates that the Amsterdam-Rotterdam-Antwerp hub, which accounts for around 25% of Europe's storage is at 57% capacity. The realization that Cushing storage is being used up has reportedly seen the cost of storage increase to around $1 a month per barrel, up from 40 cents last fall. Some also seen in the oil steep contango (higher prices for future oil than near-term delivery) the impact of limited storage facilities. Meanwhile, more storage facilities are being built in Houston, Texas and St. James, Louisiana. The CME is also set to launch a futures contract on oil storage later this month. There will be 7,000 futures contracts offered, each good the storage of 1000 barrels of oil for a month at the Louisiana Offshore Oil Port (LOOP). Oil can also be stored in ships. Reports indicate that around 40 super-tankers were secured in January to store oil offshore for up to a year. However, it appears that only a couple of ships are being used for storage, which typically is more expensive than land-based tanks. There is another place that some are storing their oil: in the ground. That is after an oil well is drilled the rig is removed, and the well capped. Some producers apparently are finding this to be a reasonable solution to the problem of low price oil and increasing storage costs. This speaks to the speed to which US shale producers can respond to a firming in prices. It also indicates the challenge faced by OPEC if it thinks that the drop in prices is beginning to discipline US producers.